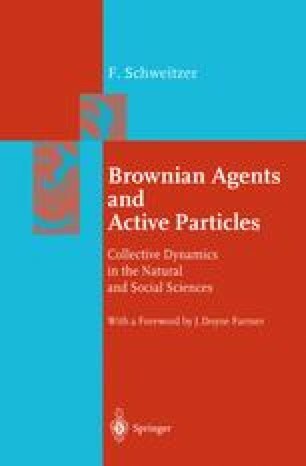 In this chapter, Brownian agents will represent individuals of a spatially distributed “community” who are also allowed to migrate. The different opinions of the agents on a specific subject may be described by the internal parameter θi. The agents’ decisions to migrate and to keep or to change their opinions may be influenced by direct or indirect interactions with other agents, such as persuasion, support, or imitation. We try to capture these rather complex processes in a formal model that reflects some basic aspects of social dynamics, although it still can be treated by analytical methods of statistical physics. In fact, in recent years there has been a lot of interest in applications of physical paradigms for quantitative description of social processes [100, 174, 210, 449, 518, 536, 541, 543]. These attempts usually raise controversial discussion. From the perspective of life and social sciences, one is afraid of an unjustified reduction of complex relations in social systems to fit them into a rather “mechanical” description . From the perspective of physics, on the other hand, it is claimed that the description of social processes “evidently lies outside of the realm of physics” (to quote an unknown referee).